What Is Intelligent Trading Tech (ITT)? I will go cover in more extensive detail exactly what the platform is and how it will function shortly. However, before exploring this, it is essential to explain exactly what problem the platform aims to solve. After all, this is essentially the core element of any business or cryptocurrency. As I’m sure most of you know, the Cryptocurrency market has grown at an incredible rate of the past year or so and shows no signs of slowing down. In fact, many people (including me) would argue that the market is still in its infancy and will most likely grow at the same or an even faster rate over the next few years, especially once public adoption occurs and cryptocurrencies can pass ‘The Grandma Test’. The words “HODL” (or “HOLD” for those who haven’t seen the meme) are often screamed in the Cryptocurrency space. The idea is to hold your cryptocurrencies for the long-term, rather than selling regularly. An argument could be made for the validity of this. However, a stronger argument could be made that the potential for traders (who do the opposite of holding) is far, far greater. Therefore, it is growing a rapid rate so, even the average traders are making considerable returns as average crypto prices rise. This is direct contrast with regular financial markets where around 90% of traders actually lose money in the long-term. The higher the volatility in a market, the greater the opportunity for traders. Think about it like this; in a regular financial market, it may take several weeks to see returns of 20% for example. In the cryptocurrency market, changes like this occurs in the space of 24 hours on a regular basis. Therefore, the potential for profits is far greater. Yes, it could be argued that the opportunity for losses is greater also but this is just the risk traders take so it will put very few off. Most regular financial markets open and shut every day at set times and are closed during weekends. Cryptocurrencies, on the other hand, can be traded at all times on any day. The inherent benefit is pretty clear for traders here; a market which trades for a greater number of hours has greater profit potential. Cryptocurrencies are borderless, meaning that they are not inherently tied to any country. The benefit of this is less significant than other factors but it does mean that information is more evenly distributed between all countries, compared with a business based in a country where there will often be better information for those in that country as a result. As a consequence of these factors, the market for crypto-trading is growing rapidly as many traders are making the switch from regular financial markets to the crypto-trading world. So, I’ve covered everything that is great about the crypto-trading world but what about the negatives? The Cryptocurrency market has evolved in the age of the internet which means that information is freely available to all and this is only increasing further as demand increases. Think about this… by reading this article, you are actively consuming the information that I have on Intelligent Trading Tech and this is all possible due to the new systems constantly arising to aid this process e.g. Steemit. However, as the amount of information increases so too does the quantity of misinformation, disinformation and pump & dump schemes. As a result, the job of a trader becomes far harder as they navigate the tough terrain of the market; keeping up to date on truthful and useful information, while disregarding negative sources of information. As someone who has personally tried his hand in trading, I can attest to the fact that this is much easier said than done. 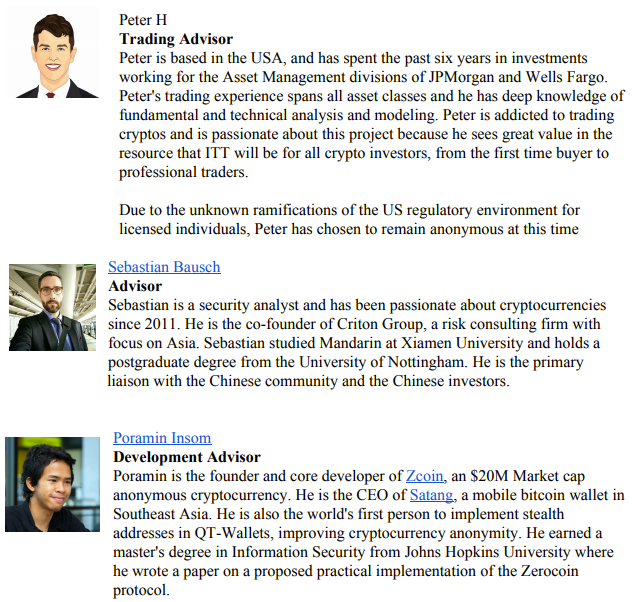 I’ve been contacted my many individuals telling me that I should buy a certain cryptocurrency and later found out that they themselves bought in just after a pump and are subsequently attempting to get others to invest in order to help their own investment; not because they actually believe it is a good idea for me. Thankfully, I have always been wary of this and never invested but, unfortunately, this is the easiest of all scams to spot. Considering the number of posts I see in Crypto groups where people will happily lie in order to pump their chosen coin, it’s no surprise that so many traders are caught out by this sort of thing. So we’ve established that there is incredible potential for traders and thus more and more traders are joining every day. Unfortunately though, there is significant difficulty for traders to make reliable decisions due to the crazy amounts of poor and intentionally misleading information in the marketplace. How Are ITT Solving The Problem? Intelligent Trading Tech will be solving the problem by creating a platform which is capable of analysing thousands of sources of information and provide users with trading opportunities via alerts. The platform will provide alerts for traders so that they can always make their own trading decisions. The platform will make use of Artificial Intelligence (AI) which is designed to emulate the activity of the human brain and how it processes information. This is particularly effective for predicting future events (or prices) based on past performances. 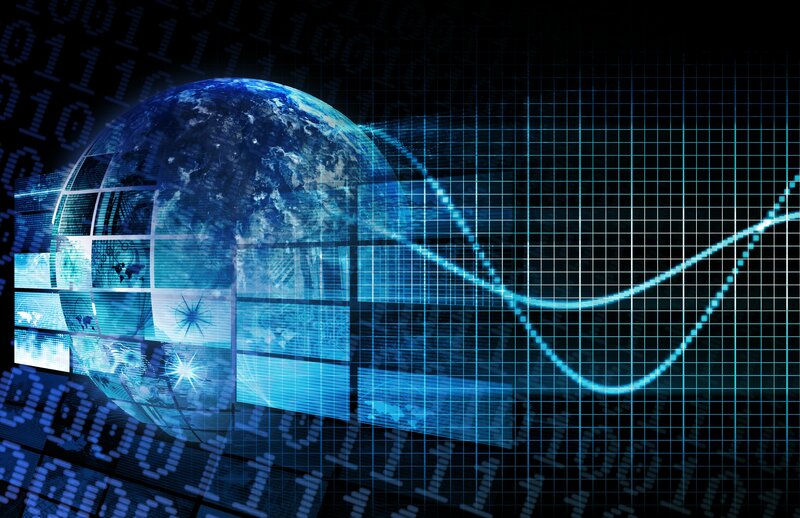 Capable of processing and comprehending data faster than any human, the potential for both high-frequency trading and longer-term predictions based on intelligent intuitions leads to substantially greater captured profits. The system will work through the pairing of traditional market trading concepts with today’s cutting-edge pattern recognition and machine learning capabilities. The real value comes from the ability of the intelligent bots to analyse a massive wealth of information and identity entry points and notify traders about price movements BEFORE they happen. 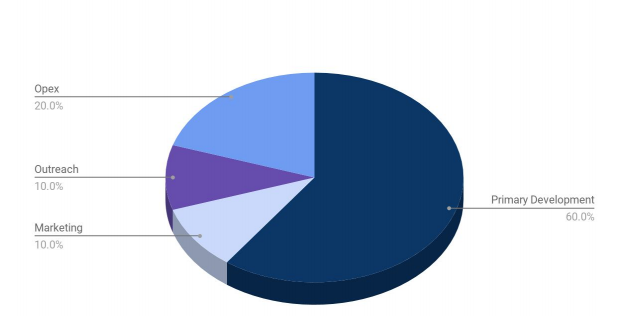 This increase (as seen from the diagram above) in investment into AI over the past few years represents the growing prevalence of artificial intelligence with the financial markets being a particularly key usage. Above, you can see how ITT will be solving a real problem in today’s crypto-trading world. However, to be honest, that description doesn’t really cover enough detail for you to fully understand the platform. For this reason, I will give extra details here for you guys. As mentioned, the platform will be able to send alerts to traders so that they can easily cut through all of the misinformation and see the real, actionable information. Volume Summary (Current buy/sell volume along with the increase from average volumes over the past 2 hours).I have to say, I am a big fan of the crisp, clean design of the trading alerts with a very clear action (bullish/bearish) combined with a star rating in order to show the strength of the signal. For me the following point is pretty huge so please pay attention… There is also a link with each indicator to see a full report detailing the alerts which were triggered in order to produce the indicator. The reason I highlight this is because I have signed up to trading signals myself in the past (regular financial market admittedly) and the majority give very little information to explain the signal. Without this info, it is impossible to determine how good the signals are and whether they can truly be relied upon. Instead, if you can see exactly why a signal was produced, traders will ultimately be able to make their own decisions based of their knowledge and training. The Intelligent bot (scheduled release in Q4) will be capable of self-programming and reprogramming to match changes in the market, adjusting indicator weights, and continuous optimisation as an agent motivated solely on maximising the traders hourly return rate. I’ve decided to give the future tier 2 subscription service its very own section because I believe this element is very important and could allow it to stand out from the crowd. Popular Crypto sites e.g. Coin Telegraph, CoinDesk etc. The bot will scan for positive or negative sentiment towards the crypto and include this in its evaluation. It will also scan google trends to find key search queries and take note of the rising ones. I believe that this element is extremely important in the crypto-trading world because, let’s be honest, prices in the market are HUGELY affected by the perception of the public about individual cryptocurrencies. In fact, sentiment is so important that it can cause incredible price swings in rapid times. So much so that I would actually say crypto prices are almost based more on sentiment than fundamentals. Some of you may disagree with me here but, if you consider that prices are driven mostly by speculation rather than real usage, then it should be clear that the effects of positive/negative news or public perception could actually outweigh alterations to the cryptocurrency fundamentals. This may sound ridiculous and you would be right to say that in any other market but the Cryptocurrency market is not just any market. Put it this way, Bitcoin is worth more than Paypal overall and yet the number of transactions on Bitcoin is a tiny fraction of the number on Paypal; evidently the speculation about future potential is driving Bitcoin’s price, not its usage. 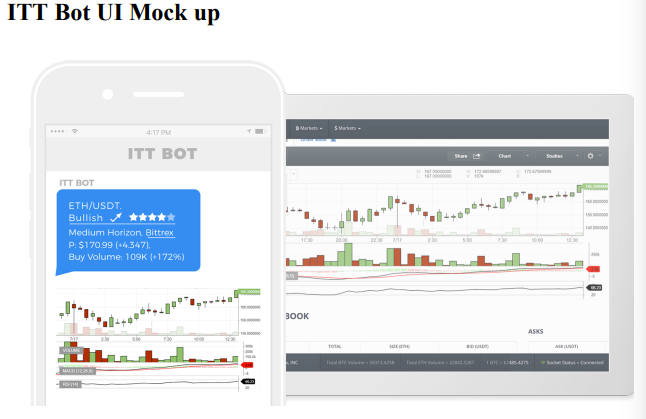 As changes in public sentiment have arguably the largest impact on speculation and thus prices, it would be an incredibly powerful tool if the ITT team are able to successfully build a bot which is capable of processing all of this highly relevant information. Tokens are used to pay subscription fees by customers in order to gain access to Tier 1 and Tier 2 memberships. As they will be the only method of paying for subscription fees, the tokens are fundamentally important to the platform and thus should rise in value as usage increases. On top of this, 25% of all subscription fees collected from users will be burned, hence reducing the supply of tokens and causing the value to rise over time. There is also a relatively low supply of just 21 Million to begin with so prices should rise even further. Tier 1 subscriptions service will begin at around $5/month and will include alerts based on numerous technical indicators. Tier 3 subscription will launch in 2018 Q3 and will include a separate quant fund powered by the ITT platform’s technology. ITT tokens will represent the future exclusive opportunity to convert into a separate quant fund using ITT’s technology. For tier 1 and tier 2, prices will begin at $5/month and $20/month but they will adjusted based on the formula provided in the whitepaper (http://intelligenttrading.org/whitepaper.pdf see page 15). This formula factors is based on a number of factors including the number of subscribers, the relationship between the USD value and the ITT token and elastic to the ratio of total subscribers to the total market cap of all cryptocurrencies. Release of alternative alerts via Slack, WeChat, Twitter, Wire, Ambit. API access to user account on exchanges for faster trade initiating and option for implementing smart automated loss prevention trades. The team is always incredibly important for any ICO; without clear leadership and strong execution, even the greatest ideas are destined for failure. Reading through the backgrounds of the team members, they appear to be a well diversified and highly qualified team. On top of this, I have personally been in contact with Ben (Co-Founder) and other team members and I can say that they have been a pleasure to speak to; replying to me and other potential customers very fast and with extensive responses to questions. The sale began on August 18th and will finish September 17th unless the hard cap of $4.2 Million is reached before this time. The Token Sale finishes in just 9 days so, if you want to get involved, do so very soon! 10% of tokens will got to original contributors, the development team and advisors. 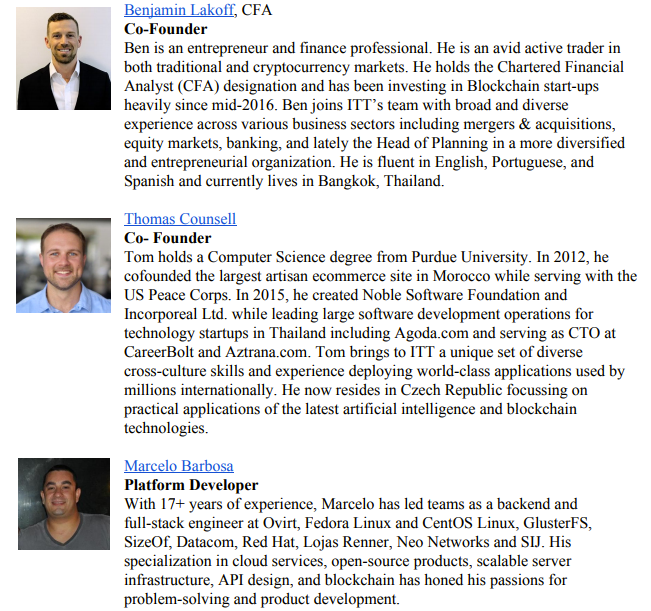 Token distributed to these individuals will be locked up for 12 months in order to ensure that their priorities remain aligned with the users. There is also a bonus for individuals contributing larger amounts of Ether. Under the ‘Legal Considerations’ section of the whitepaper, it is clearly stated that ‘ITT tokens are functional utility tokens within the ITT platform. ITT are NOT securities’. This is great news due to the legal issues surrounding Cryptocurrencies which label their tokens as securities. On top of this, there are 2 whitepaper pages dedicated to just the legal considerations. I believe this to be a promising sign as it is indicative of the effort put into the whitepaper; virtually all cryptocurrencies are subject to the same legal considerations yet the majority don’t include such a detailed description. It is always reassuring to see such hard work put into all aspects as it shows the dedication that the team have towards the project. The token sale ends very shortly so, if you decide to invest, you should so very soonDisclaimer: I am not a financial advisor and I never recommend financial decisions for anyone. I am 100% honest with my followers about what I believe but you should still never invest without carrying out all of the proper research yourself!